Rental cars, shared shuttles, regional flights, private drivers, taxis, public buses, boats—there are many ways to get around Costa Rica. For most visitors, a bit of this and a dash of that will do the trick—but which this and which that? Our guide introduces you to the options, outlining the advantages (and disadvantages) of each method. So you can save time or money or miles—it’s your choice. One of the most important things to remember when taking a taxi in Costa Rica is to only hire licensed, authorized cabs. Affectionately known as “rojos” due to their cherry-red color, these taxis are easily identifiable and can be flagged down as you would anywhere else. However, in some parts of the country, illegal taxis, popularly known as “piratas”, can often be mistaken for an authorized cab, as their drivers make every attempt to appear legitimate. The easiest way to differentiate between a genuine and illegal taxi is to look for the yellow triangle on the vehicle’s doors. Even though they might be a little cheaper, don’t be tempted to take an illegal cab—stick to the authorized taxis. In Costa Rican taxis, the meter is known as the “la Maria,” and this device is usually mounted on the vehicle’s dashboard. Before setting off on your journey, ensure that the Maria is turned on, as this can eliminate the possibility that you’ll be overcharged for your trip. To request that the driver turn on the meter before you hit the road, simply gesture at the Maria and say “Puede poner la Maria por favor,” which means “Can you please turn on the meter?” Most drivers will not take offense to this request, and it helps keep everything straightforward when it comes time to pay. In terms of rates, official cabs charge approximately $1 for every two-thirds of a mile traveled or so, making taxis a remarkably cost-effective way of getting around. After 10pm rates go up slightly. This is noted by a 2 or “n” on the Maria. For longer journeys, agree on a specific rate before you set off. For example, a trip from San Jose to Manuel Antonio National Park costs around $200. Wherever you’re planning to go, be sure that everyone’s on the same page to avoid issues upon arrival. If you’re not sure what a reasonable rate might be, the concierge at your hotel will be able to help you. Tipping is not expected, but the little extra money is always welcome. Avoid using big bills as drivers don’t have a lot of change with them and are reluctant to take anything larger than US $20 dollar bill. Regulations for Costa Rican taxis can seem a little strange to some visitors. For example, the “rojos” are not licensed to pick passengers up at the country’s airports, but they can drop them off. If you need a ride to your hotel after landing in Costa Rica, you’ll need an orange cab, which operate under cooperatives between private companies and the Costa Rican government. 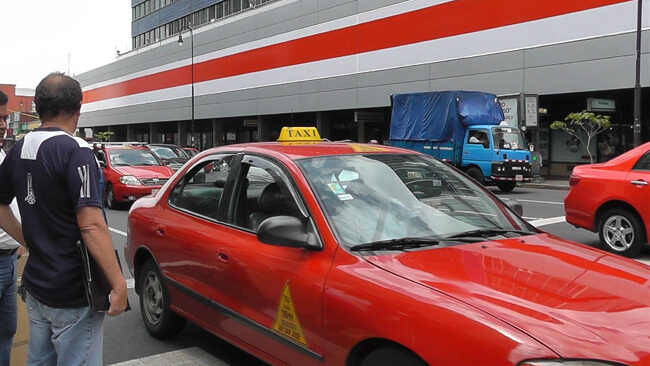 These cabs are only licensed to transport passengers to and from the airport so when you arrive, don’t waste time calling or trying to flag down a red taxi—they won’t be able to pick you up. Another type of private transfer you might encounter during your trip to Costa Rica is “porteadores.” These are licensed, legal taxis that are privately owned; as such they can be any color and will not bear the yellow triangle that the “rojos” have. These cabs are perfectly safe, but they can only pick up passengers from either hotels or private residences—you cannot flag them down on the street. The driver’s permit will usually be displayed in plain sight where passengers can see it and their prices are similar to those of authorized red taxis. Perhaps the most affordable way to get around in Costa Rica is by taking a public bus. Although there is no unified national bus network, these buses head to practically every major (and minor) destination in the country and provide you with the opportunity to meet the locals and enjoy the scenery rather than watching the road. 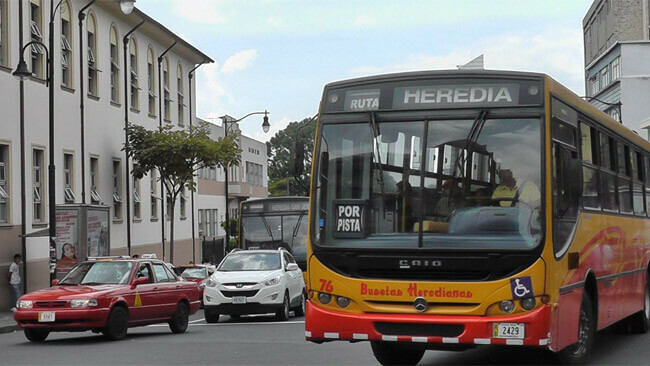 San Jose is the main transportation hub in Costa Rica, but there isn’t a centralized bus terminal—instead, various companies operate buses from several hubs throughout the city. If you’re planning to see the sights by bus, be sure to check in with one of our knowledgeable travel experts to get the lowdown on where and when to depart. It’s worth knowing that while buses are inexpensive, they often take much longer to get from one place to another than driving yourself would. Routes typically avoid major highways and make frequent stops in small towns and villages. If you’re not pressed for time and want to save a few bucks buses are ideal, otherwise stick to another mode of transportation. Another popular option for getting around Costa Rica is shared shuttles. These air-conditioned minibuses are much more comfortable than typical buses and have a network that covers most of the country. One of the main advantages of using a shuttle service is that they coordinate pickup from and drop-off to many popular hotels, meaning you can depart and arrive in comfort without needing to worry about connections. Another reason shuttles are so popular in Costa Rica is their affordability. Although a trip in one of these shuttles can be between three and five times more expensive than a regular bus journey in public bus, for many it’s still a deal. If you’re staying in San Jose, you can reach some of the country’s most popular tourist destinations including Jaco, Manuel Antonio, Monteverde and Mal Pais for less than $50 per person. There are two main shuttle companies in Costa Rica—Interbus and Gray Line. These two companies provide shuttle service between virtually all major cities and towns across the country, plus some destinations a little more off the beaten track. Shuttles depart frequently, with some routes offering shuttle service several times per day, but some destinations a little further afield may only have one or two scheduled departures. For exact timetables, check the company’s official website. As shuttles are popular with locals and tourists alike, it’s often necessary to reserve tickets in advance. Both Interbus and Gray Line offer online booking facilities, so rather than taking a chance on a free seat being available, ensure that you reserve your spot ahead of time to avoid disappointment. Arrangements can also be made through your hotel concierge. Tip: Keep an eye out for special discounts for multiple transfers when booking. Sure, you could always hop in your rental car or take a public bus to get where you want to go, but since you’ll probably want to see as much of the country as possible, you might want to consider taking an internal flight to save some time. Domestic flights are the ideal way to cover a lot of ground quickly, as most major cities and regional airports are just an hour’s flight away from one another. Air fares are reasonable and, if you really want to travel in style, you can charter a private plane to enjoy the stunning sights of the Costa Rican landscape from a bird’s eye view. Aside from being convenient, domestic flights are often a preferable way to travel, especially when venturing to remote areas. Costa Rica’s road network can be arduous in some parts of the country, making travel times between certain destinations quite lengthy. In addition, some parts of the country, such as Tortuguero on the Caribbean Coast and Drake Bay on the Osa Peninsula, are not accessible by road at all, making charter flights and a subsequent boat ride the best way to reach these secluded destinations. Much of Costa Rica’s appeal lies in its beautiful, pristine beaches. Boasting two coastlines—one along the Pacific and the other on the Caribbean Sea—it should come as little surprise that the islands off the coast are a great place to visit. This is where boats come in. Some areas are only accessible by boat, so whether you want to reach a specific destination or just have a relaxing afternoon on the water, Costa Rica boat rides are the way to go.